I cannot believe how many months have gone by since I posted any blogs. I have been busy and have painted quite a few new pieces. I have also been enjoying trying out under paintings beneath my pastels, and am still experimenting with the effects. The next thing I realized was I was lying on the kitchen floor, my head hurt and two of our kitchen chairs were lying on their sides. I thought, what on earth am I doing on the floor. I set one of the chairs upright and tried to get up and passed out again. The next thin I realized is my wife Cindy is slapping my face and saying stay awake, don't go out, stay with me. She had apparently called my daughter who was out running and told her I had passed out and then called 911. My daughter made a beeline back home and was home before the ambulance arrived. My wife and daughter helped me into a chair and I felt very disoriented and was perpsiring profusely and shaking. When the paramedics arrived, they took my vital signs and put oxygen on me. They could apparently tell that my heart and was behaving erratically and my blood pressure was way out of wack. I was soon loaded into an ambulance and rushed to Auburn Faith hospital. I had wonderful care and attention at the hospital and they hooked me up to monitors and did an EKG realizing that I was in a condition called atrial fibrillation, where the heart chambers get off sync and beat erratically depriving ones body of life giving oxygen. That is why I had passed out and become so disoriented. I was admitted into intensive care for a day and a half until the medication the doctors had given me brought my heart back in control, and it began beating normally once again. I was seen by a cardiologist and asked him whether anything I had been doing the day before had contributed to my situation. He said no, not at all. Your heart has performed well for 68 years and just decided it isn't going to continue to beat as it had. From now on, you will just need to take a prescription medication that will keep your heart on track. I remained there overnight for observation and tests and was released after lunch the following day to go home. The doctor said I could resume my normal routine, but my wife was very concerned and did not want me doing much of anything until we could see the cardiologist we had been referred to. We had planned on leaving on vacation for Pismo Beach the following day prior to this happening, and my son and his new wife Maria were planning on flying out from Lynchburg, Virginia to join us in Pismo Beach. First thing Monday morning, I called the Cardilologists office and asked if it was possible for them to squeeze me in that day. I explained our situation and they said they would see what they could do. Several hours later I received confirmation that Dr Berte could see us at 3:45 that afternoon. Once I arrived at the doctors office we were ushered into a room and his nurse Diana administered an EKG to let the doctor see how my heart was performing at that moment. When the doctor came in, he reviewed it and said we were free to go to Pismo Beach and he would see me when I got back to wear a monitor for 24 hours and also to take a stress test. Cindy was concerned but the Doctor allied her fears and we went home to pack. It was great to be hitting the road early in the morning and we had an uneventful and pleasant drive over Pacheco Pass and on down Highway 101 to Pismo Beach. We got there about an hour and a half after our son and his bride Maria. They had set the trailer up and then gone for a walk on the beach. Unfortunately our trailer had leaked over the past two years and water had ruined the bedding and blankets and sleeping bags in the trailer. It was a mess to clean up and Cindy went to buy all new bedding and blankets. It was her birthday that day and we celebrated by going to dinner at the Old Port Inn on the pier in Avila Beach. We had a wonderful meal and afterwards went back to the trailer, made up fresh beds with the new linens and went to sleep for a good nights rest. Our week in Pismo was wonderful and relaxing. 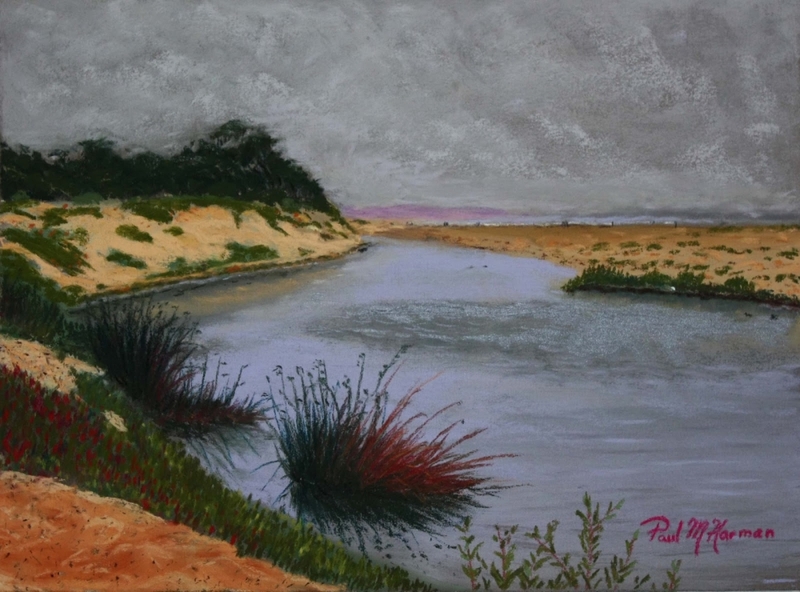 I started painting a scene of the lagoon in front of the sand dunes while we were there. I finished it this past week. I hope you like this one. It was started on a cool foggy morning and it was a joy to enjoy the solitude and see all of the waterfowl activity in the lagoon. Over a week ago I took my stress test and passed it with flying colors. Dr. Berte told me I have no restrictions and can do anything I want. He doesn't need to see me for six months. God is good, and I feel grateful and blessed to be alive to enjoy my family and continue to paint. Life is too short, so don't forget to do the things you really wan to and enjoy each and every day.